The Cowley College Concert Band and Concert Choir performances on Tuesday, October 25 will be the first with new instrumental band and choir leaders Evan Ricker and David Smith at the helm. The two new instructors are eager to share the Robert Brown Theatre stage. There is no cost to attend the concert which will begin at 7 p.m. The Concert Band will perform a family pops concert featuring works by Danny Elfman and Alan Menken. Ricker came to Cowley with the goal of developing solid musicianship as well as a sense of ensemble unity. The Concert Choir will perform a variety of styles, from the traditional folk tune of Home on the Range to the contemporary harmonies contained in The Eyes of All Wait Upon Thee by Jean Berger. 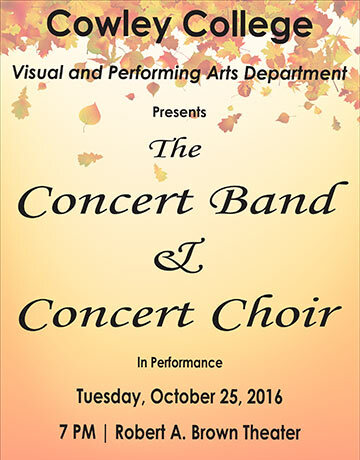 The Concert Choir will perform the following pieces: Festival Sanctus by John Leavitt, Chorus of the Hebrew Slaves by Giuseppe Verdi/ed. John Rutter, The Eyes of All Wait Upon Thee by Jean Berger, Alleluia, This is the Day! by Brad Croushorn, The Majesty and Glory of Your Name by Linda Lee Johnson, Wanting Memories by Ysaye Barnwell, and Home on the Range arranged by Mark Hayes. Following the concert on October 25, the Concert Choir’s next performance will be the Vespers Concert on Sunday, December 4. The Concert Choir has also been invited to Friends University’s Sing It! Festival in February with guest conductor Francisco Nunez of the Young People’s Chorus of New York City.